Stratton Mountain Scout Reservation was from Fort Orange Council which merged in 1963 to become Fort Orange-Uncle Sam Council. The Camp book shows Stratton Mountain as existing from circa 1952 until 1971. Can anyone date the years of use for this cut edge patch? 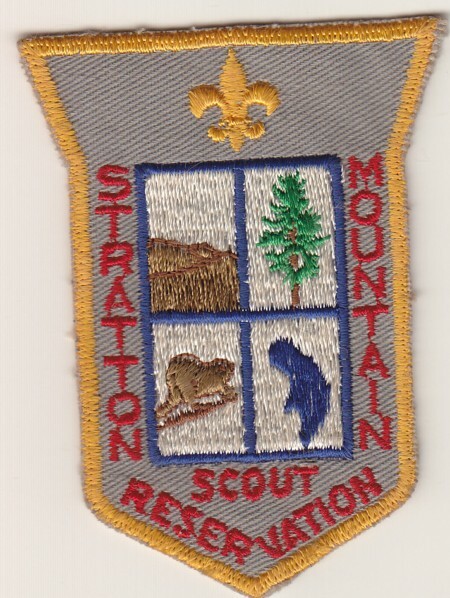 I attended Stratton Mountain Scout Reservation from 1973 to 1975 and was going to attend in 1976, I joined the Coast Guard. The patch you have the picture of is the patch that received. All of my patches as a kid were lost in a fire. And I would love to know a place to buy this one.. The patch had a Shivering of the year attended. For me it was patch the 1973, 1974 and 1975 under it. Ones earlier than 1968 had a Tenderfoot design rather than the FDL as shown. 1964 had no date whereas 1965 had a Red date, 1966 a Green date and 1966 had ? date (I don’t have this patch). There was a round silver myler bordered for the 25th ann’y 1976 was a round 1776-1976 Liberty Bell (Believe National design). In 1977 and 1978 the design was as the one shown, but had a silver mylar border and gray background. The final year’s patch was as shown, but contained the words 1950-1979 in Red. « TMR 1956 Headquarters Staff?